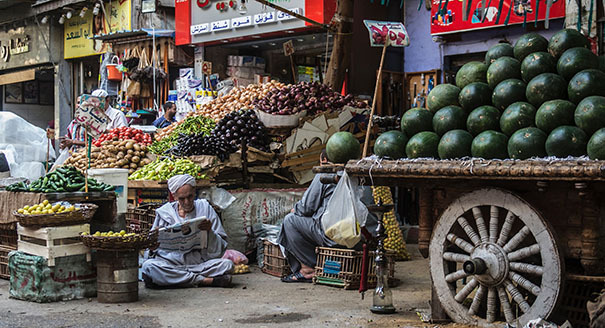 Egypt’s economy may be improving, but this is neither inclusive nor sustainable. Saad Andary of Lebanon’s Central Bank says its foreign currency reserves guarantee financial stability in the years ahead. Economist Jad Chaaban talks about the challenges to Lebanon’s economy, but suggests that not all is bad. Bassem Nemeh discusses the economic burden of the Syrian refugees for Lebanon and Jordan. There are a number of less visible impacts of the ongoing standoff in the Gulf. Academic Yang Guang discusses an ambitious plan that includes future Chinese cooperation with the Middle East. In an interview, Amr Adly discusses his recent Carnegie paper on Egypt’s large private enterprises. Hoshyar Zebari, no paragon, has fallen victim to his rivals’ political machinations. The question is not whether the Sisi regime will last, but the kind of regime that is likely to emerge from Egypt’s economic turmoil. Assad’s Other War: Winning on the Ground, Defeated by the Pound? The rapid depreciation of the Syrian pound has caused a further decline in the living standards of ordinary Syrians and threatens the continued functioning of what remains of the state.